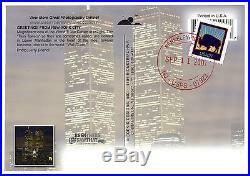 World Trade Center postcard postmarked''Sep 11 2001'', the day of the tragedy. 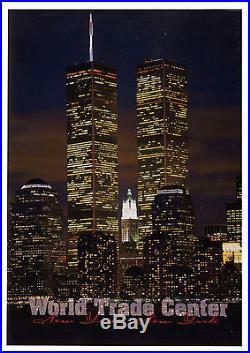 Image features the World Trade Center buildings, illuminated at night. Unused postcard is stamped from the Post Office in Berkeley Heights, NJ, a suburb of Manhattan. Measures 5.75'' x 4.25''. 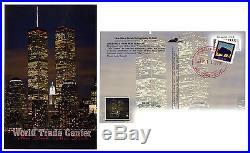 The item "World Trade Center Postcard, Postmarked 9/11/01" is in sale since Monday, January 23, 2017. This item is in the category "Collectibles\Postcards\US States, Cities & Towns\New York". The seller is "n8sautographs" and is located in Los Angeles, California. This item can be shipped worldwide.